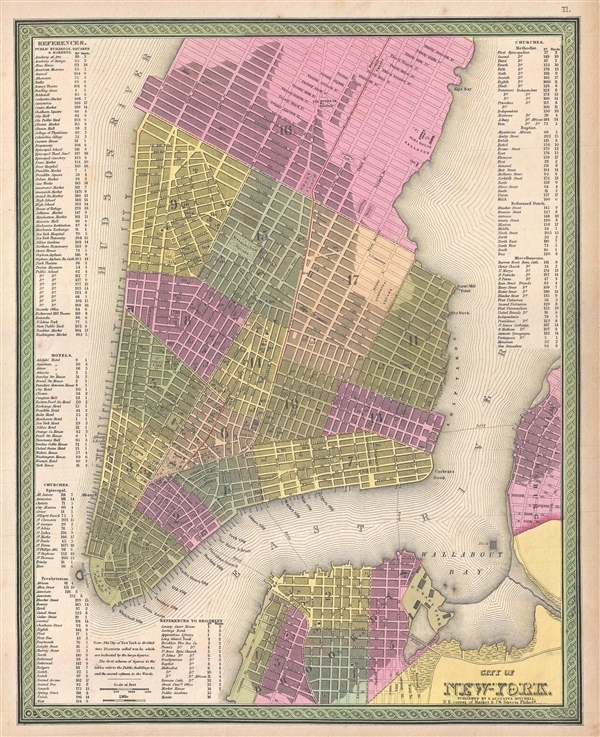 One of the more attractive 19th century commercial atlas maps of New York City. One of the more attractive atlas maps of New York to appear in the mid-19th century, this is a beautiful example of Samuel Augustus Mitchell's 1849 map of southern Manhattan. The map depicts southern Manhattan from 37th street (Kips Bay) south to Battery Park and Brooklyn from Williamsburg to Columbia St. Mitchell offers wonderful detail at the street level including references to parks, individual streets, piers, ferries, and important buildings. Color coded with red, green, and yellow pastels according to political divisions. An index of churches, hotels, markets, squares, public buildings etc. is included along the left and right borders. The whole is engraved and colored in Mitchell's distinctive style with green border work and vivid pastels. This map was issued in the 1849 edition of the New Universal Atlas. It was the last edition of that atlas to be published by Mitchell prior to selling the plates and rights to the atlas to Thomas Cowperthwait in 1850. Mitchell, S. A., A New Universal Atlas/i>, (S. A. Mitchell; Philadelphia) 1849. The New Universal Atlas is one of the great American atlases of the mid-19th century. Samuel Augustus Mitchell first issued the atlas in 1846 when he acquired the map plates and copyright for Tanner's New Universal Atlas from its publisher, Carey and Hart. The first transitional 1846 edition was published jointly with Carey and Hart, but a second edition was published in the same year with the Tanner imprint erased. This edition of the atlas also introduced the signature S. A. Mitchell green and pink color scheme. Most of the maps from the early editions of the atlas were engraved by H. N. Burroughs or C. S. Williams, often bearing their copyright. Burroughs maps also tended to have what map collector David Rumsey refers to as the 'Cary and Hart' borders, which featured a narrow vine motif. These borders were replaced, along with the Burroughs imprint, with the more traditional Mitchell strap work border used in the atlases until 1856. Mitchell published editions until late in 1850, when he sold the rights to Thomas, Cowperthwait and Company of Philadelphia. Under Cowperthwait, the atlases continued to be published and bear the Mitchell name until 1856, when it the plates were again sold, this time to Charles Desilver. Desilver reworked the plates with new border art and a revised color scheme in the style of J. H. Colton. Desilver issued editions from 1857 to 1860, when the atlas was phased out in favor of Samuel Augustus Mitchell Jr.'s New General Atlas. Very good condition. Blank on verso. Bright and clean. Rumsey 4835.018. Phillips (Atlases) 6103-11. Haskell, D. C., Manhattan Maps: A Co-operative List, 901.